KOYELAANCHAL takes a reallyyy longgg time to come to the point. Ideally, Asshu should’ve established the characters and set the ball rolling within 15/20 minutes of the commencement of the film, but much of the first hour is devoted to establishing the characters, depicting bloodshed and the pathetic condition of the locals. The wheels start moving only before the intermission, when Karua attacks Nisheeth. It’s at this juncture that the writing gets interesting, when the two warring factions lock horns. 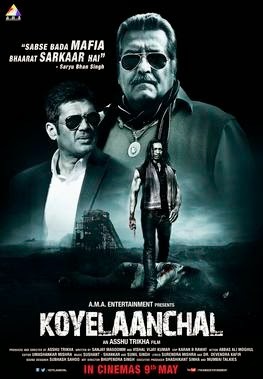 On the whole, KOYELAANCHAL is absorbing and engaging, especially towards the second half. Should find its share of audience at single screens specifically. On the whole, Koyelaanchal is a violent drama which becomes soft mid-way. It is a good commentary on the coal mafia but as far as its entertainment quotient is concerned, it is very limited. It will, therefore, not be able to do much at the box-office except in some pockets. Koyelaanchal lacks a proper story. From coal mafia to collector’s baby to Karua’s change of heart to Maoist movements, you keep wondering what the film is all about! Characters jump in and out of the film randomly. The action scenes are poorly executed and the sound effects are terrible. The intent was to expose the mafia’s atrocities but that does not come across at all. Director Ashu Trikha succeeds in parts but the film is no patch on Anurag Kashyap’s cult Gangs Of Wasseypur. If B-grade films entertain you, only then you should watch this film.